The SurfShot Surf Photos section was created to showcase the best Surfing Photography in California. With hundreds of thousands of surfing photos from our users, surf reporters and from the SurfShot Magazine, you will see one of the best collections of surfing photography from the Golden State right here at SurfShot. Participate and join our community. Posting Surf Photos to our site is as easy as posting to your Facebook wall. Create an account and start posting your surfing photos of yourself or your friends. 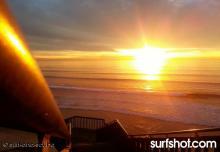 Select what surf spot or region your picture belongs to and have your surf photo show on that spot surf photo section. Join, post, share and have fun!